DD note: Anabel Hernandez is a well known Mexican journalist who has covered politics and organized crime for two decades. She is the author of Narcoland: The Mexican Drug Lords and their Godfathers, "a ground-breaking examination of the people and politics driving Mexico’s drug war." This is the story of her negotiating the video interview with Caro Quintero which Chivis posted and Un Vato translated for Borderland Beat on April 4. In this story Hernandez tells of the arduous trek into the mountains to meet with Caro Quintero, her impressions of him and the questions she still has after the interview and gives some history of Quintero .for those readers who have not followed the drug wars in Mexico and don't know who he is. MAZATLAN, Mexico ― It’s just before 8 p.m. but, in the Sierra Madre mountains south of El Paso, the darkness is almost complete, save for a single light that illuminates a small house. We have spent the last 12 hours driving through Mexico’s heroin heartland, where thousands of tons of poppies are harvested and processed every year before being smuggled to the United States, and the view from the modest house near the peak is spectacular. The person I have come to meet ― Rafael Caro Quintero, aka “The Prince” ― is unlikely to enjoy the view, however. Caro Quintero is a man on the run. Hunted by Mexican and American authorities, he never sleeps in the same spot twice, according to his guards. His bed is a sleeping bag, his roof the canvas of a tent. During the day, he haunts the mountains like a ghost, his head perpetually craned toward the sky, scanning for the drones that search the impassable mountains for signs of life. The U.S. Drug Enforcement Administration believes that he, along with Ismael “El Mayo” Zambada, is the leader of the Sinaloa drug cartel, one of the largest, most powerful criminal drug trafficking organizations in the world, with tentacles that extend throughout the Americas and into Europe, Asia and Africa. 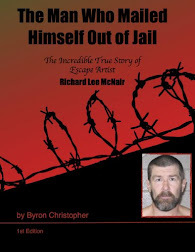 They also believe he is a murderer who, even if he spent almost three decades in prison, still hasn’t paid in full for his crimes: the torture and death of an American undercover agent and a Mexican pilot. As a journalist, I’ve spent the last 13 years hunting the leaders of the drug cartels whose bloody business has shaped life in Mexico. Almost 250,000 people have died in the drug wars over the last decade, according to the country’s National Institute for Statistics and Geography. And those are just the confirmed victims. At least another 34,201 people have disappeared. Now, after months of trying through intermediaries to persuade Caro Quintero, I have come to this house, on this January evening, to meet with the man at the top of the DEA’s Most Wanted list. We’d spoken in 2016, but I want to get a better sense of the life of a man whom the U.S. Justice Department is so eager to get they are offering a $5 million reward for his capture. Once inside the house, I am led to a bedroom. The light suddenly goes out. “The Prince” has arrived. The trip started 12 hours before in Mazatlán, Sinaloa. For decades, this port city on Mexico’s Pacific Coast has been a key point for drug traffickers, a destination for both business and pleasure for the members of the Sinaloa cartel. It’s also the site of some of the bloodiest battles for control of the organization. Two guys in their 40s pick me up in an old car at an agreed-upon spot near the beach. I see no sign of weapons. The men are polite, dressed modestly and without any thuggish swagger. Still, as on all these trips, the destination is unknown and the return uncertain. They tell me to bring a hat and a jacket because of the cold. “The cold?” I wonder. It is over 70 degrees already – and it’s 8 a.m. I am only allowed to take a small video camera, a tripod and a light for the interview. I am told to leave everything else behind: handbag, phone, tape recorder. Even the people taking me don’t know where we are going. After five hours on the road, we stop at a hotel. They ask again if I am carrying a phone or any other electronic device. We switch cars and, by now, I am glad I brought the extra clothes. The temperature has dropped as we have driven into the mountains. During the next four hours, we switch cars three times before we get to a house where we stay for about an hour. I have overheard the Mexican military is operating in the area and the men are waiting for instructions on whether to keep moving or abort the plan. As they discuss this, a convoy of soldiers approach us in military trucks. But they appear not to notice us and drive past. The afternoon goes by. We change vehicles again and take off on a dirt road through a ravine, barreling across stones and holes, before ascending the mountain range. At this time of the year the fields look barren, but come autumn, the hillsides will be covered in marijuana plants and red poppies. Most people around here are involved in some part of the illegal drug trade – whether growing, harvesting or processing the drugs. But with the land asleep, we see few people around. Suddenly, the driver hits the brakes and stops the engine. My heart is pounding like a locomotive. The men get out of the car and look up at the sky, pointing. They have seen a drone, they say. They are concerned that I may not be telling the truth, that someone is following me to get to Caro Quintero. We don’t speak about it, but I’m quite certain they’re thinking about El Chapo, who in 2015 met with Sean Penn and the Mexican actress Kate del Castillo for an interview. The Mexican government intercepted communications between the drug lord and the actress, and El Chapo’s confidantes believe the interview led to his arrest a few months later. Today, he is locked up in a maximum security prison in New York, waiting for a trial that is expected to result in a life sentence. After several tense minutes, we get back in the car. The guards constantly look toward the sky, then back at me with suspicion. The area is full of government drones, they say, and their boss barely sleeps, sensitive to their buzzing he claims to hear constantly. He’ll often wake his guards before daybreak because he thinks someone is coming to arrest him. Some nights, they’ve had to walk perilous routes in the dark along the cliffs because he believed the authorities were closing in. More than once, Caro Quintero has taken a fall in the darkness. He refuses to have surgery for his diseased prostate, for fear of laying up at a hospital for a week, leaving him exposed to arrest. For months, he hasn’t seen his wife, Diana Espinoza, who he met in 2010 when he was still in prison, or their 5-year-old son. Nor has he seen any of the four children he had with his first wife, María Elizabeth Elenes. This is not the glamorous life he once led. Diana Espinoza, Rafael Caro Quintero's wife, is seen in July 2016 during an interview in Culiacán, Mexico. Like El Chapo, Caro Quintero was born in Badiraguato, a small town in the state of Sinaloa. When Caro Quintero was 14, he saw a stranger murder his father in a random act of violence. After that, he began growing marijuana as a way to support his family. By the early 1980s, Mexico had become a strategic crossing point for cocaine going to the United States. 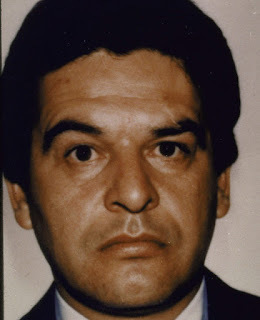 Caro Quintero, by then in his 30s, rose to become one of the three leaders of the Guadalajara cartel, which eventually allied itself with the Medellín cartel, led by the notorious Colombian trafficker Pablo Escobar. Legends and narcocorridos ― the ballads that celebrate the lives of the drug lords ― made him and the other crime bosses into larger-than-life characters, depicting them as celebrities who led glamorous lives of luxury and excess. But an enterprising undercover DEA agent named Enrique Camarena had infiltrated the Guadalajara cartel and was gathering information on the billion-dollar criminal organization. In 1984, hundreds of Mexican soldiers raided “Rancho Búfalo,” a marijuana plantation run by the Guadalajara cartel, acting on information obtained by Camarena. The estimated annual production at the ranch was worth hundreds of millions of dollars. U.S. drug agent Enrique Camarena Salazar was murdered by Mexican drug barons in 1985. In retaliation, the cartel allegedly kidnapped Camarena and a Mexican pilot named Alfredo Zavala. The abduction triggered a diplomatic crisis between the U.S. and Mexico. The Reagan administration all but shut down the border in response. When the men’s bodies were found a month later, bearing marks of torture, the DEA began a massive manhunt for the killers. The Guadalajara cartel and its leaders ― Caro Quintero, Miguel Ángel Félix Gallardo and Ernesto “Don Neto” Fonseca ― were obvious suspects. Fonseca was arrested in 1985 and still lives under house arrest at his ranch. Gallardo was detained in 1989 and is still in prison in Jalisco. Caro Quintero, for his part, was arrested in April 1985 and extradited to Mexico, where he signed a confession to the murder of Camarena. 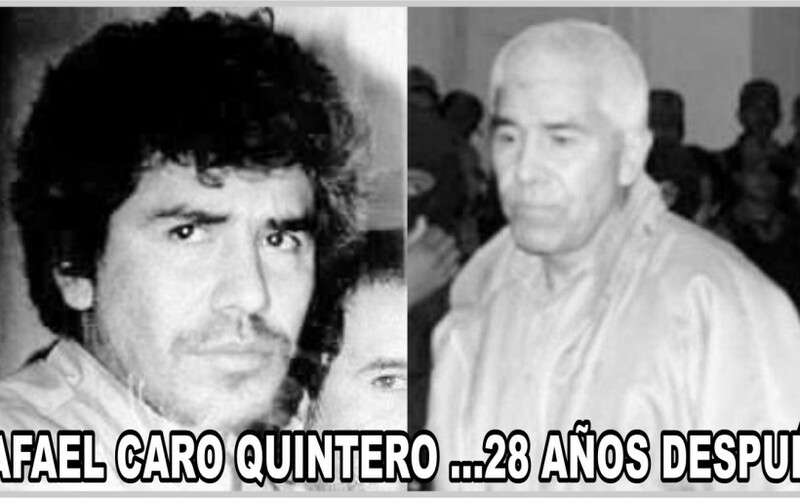 Caro Quintero spent the next 28 years in prison before he was released in 2013 on technical grounds. He was free for only a few days before the office of Mexico’s attorney general issued a new order of arrest, for an outstanding charge in Mexico and to face charges for Camarena’s murder in the United States. The decision to release Caro Quintero had infuriated U.S. authorities, who put up a $5 million reward for information leading to his capture or conviction. Caro Quintero decided to run. The light comes on. “The Prince” has arrived. He greets me warmly and reaches for a silver-plated gun tucked into the back of his waistline. “Excuse me,” he says, as he puts his gun on the table. Three guards take positions outside. A fourth stays in the room. Slim and straight like a billiard cue, Caro Quintero wears an Adidas hat pulled down over hair dyed a deep black. In smart blue pants and a green jacket, he appears younger than his 65 years. But his shoes are mud-covered and he is sweating, suggesting that life in hiding is taking a toll. “All I do is run, for something I already did my time for,” he says. Since his release in 2013, he has recanted his admission of guilt in the murder of Camarena. He admits to having trafficked marijuana in the past. But, he claims, those days are behind him. He is not the shadowy leader of the Sinaloa cartel that authorities make him out to be, he says. But the “narcomantas,” the banners that criminal gangs use for public declarations, tell a different story. Narcomantas have appeared alleging that Caro Quintero and El Chapo are the bosses in northern Mexico ― and U.S. and Mexican officials likewise claim that Caro Quintero is in charge of trafficking shipments of cocaine, meth and heroin to the United States. He acknowledges that after he was freed, he met with El Chapo and Ismael “El Mayo” Zambada García before El Chapo was arrested. I ask him about the 2015 seizure of five tons of cocaine in Puerto Peñasco, Sonora, which the Mexican government said he was shipping. Why, I ask, would the DEA finger him as a drug lord? The U.S. and Mexican authorities are driven by misplaced vengeance, he says. Here’s the report in which they accuse you, I respond. In October, Caro Quintero’s cousin, Sajid Emilio Quintero Navidad, aka “The Cadet,” was arrested by U.S. authorities. On Jan. 25, he pleaded guilty to charges of drug trafficking and money laundering, according to a filing in a federal court in California, which suggests he may have made a deal with prosecutors. And capturing Caro Quintero is still a priority for the U.S. government. “If it’s Sajid who’s accusing me, Sajid is lying. And if they’re saying I’m one of the Sinaloa cartel leaders, they’re making that up, too!” Caro Quintero says, closing his hand into a fist. But what is the truth about Caro Quintero? U.S. and Mexican officials say he is trafficking cocaine from Colombia to the United States through Guatemala, and that it crosses through Sonora on a route that ultimately leads to Chicago. “The DEA stands behind the information contained with our 2017 National Drug Threat Assessment and we believe Rafael Caro-Quintero is a Sinaloa Cartel leader,” agency spokesman Wade Sparks said in a statement. But Mike Vigil, former head of the DEA’s Mexico operations, says it’s “ludicrous” to claim that Caro Quintero has a leadership role with the Sinaloa cartel. Caro Quintero denies that he’s involved with drug smuggling. The way he tells it, he spent almost three decades in prison for a murder he didn’t commit. He says he smuggled marijuana but didn’t peddle harder drugs, and says that since his release five years ago, he has not been involved with drug smuggling. According to him, justice has been amply served. The legends and narcocorridos tell dazzling stories that romanticize the lives of the kingpins. Yet having encountered Caro Quintero in person, I feel a bit like I’ve met the Wizard of Oz. Here, behind the screen, is someone who’s spent much of his life projecting a fearsome vision of himself, only to be revealed as a frail and ailing old man. But is this just another form of subterfuge, a way to disguise a leader in the regional drug trade? As I get in the car that will take me back to Mazatlán, I see “The Prince” standing by the house. In the darkness, he soon disappears from sight. Thirty years is a long time in jail however here in the USA a pot grower from a small town named, Piedmont, Alabama USA, will never get out of jail. His name is David Ronald Chandler inmate number 17867-001. He is doing life and under the federal system that does mean LIFE. When the US gov't gets your number it matters not what crime you did or didn't do, it's all over. It's just a matter of time for Mr. Quintero. You will never live in peace I'm sorry to say. I do believe in second chances, but no one cares what I think. Good luck, Mr Quintero. Another question I have not to get off topic but in Columbia why was it so important to extradite the Cali cartel the Meddy cartel and Pablo And Carlos Leader. But Popeye is out and he’s making $ acting as a folk hero writing books getting paid for interviews and he admits to taking part in killing thousands with balms and even helping with the Avianca mu but Popeye is out like a full kero writing books getting paid for interviews didn’t hear admit to taking part in killing thousands with guns, bombs and even helping with the Avianca attack. But why has no effort ever been made to extradite him. I believe street things should be taking care of and handled in the street but innocent people hard working civilians I think people should be punished an executed for those killings. Just my opinion..
To the follower who wrote in about Chapo's lair. I am aware, and reading the book, already half way through and it is one I know all BB followers will like. Best thing...I have an interview with the author/former agent after I read the book. I will post fotos at that time. But that is why I have not posted the story. I will write a review and post with interview. Meanwhile if you are thinking of reading the book...DO IT!!!!! I have too many questions already :) but they will be very different than what is out there. because I am a Narco-Maven my question will be different. What's the point of being soo rich and always hiding and moving? Technology has made the narco lifestyle almost obsolete. Chapo was using plastic tables and lived like a poor person. All that money probably made Mexican generals and politicians very rich. Those are the ones that should be tortured and put in jail. No. Like most everyone else my reading time is limited, so I pick what I read carefully. I know a few that have read the book and liked it. My issue is that their husband got a sweetheart deal, they should not make money off the situation. Shame on them. unless they would donate to w worth cause. First time I read on BB, that the Mexican Military, is using drones to capture Caro dead or alive. Caro says he is not into crime, but yet has cars and men, to switch and avoid cature. Don’t believe charity driving services for senior citizens is a program ran by Mexico’s government! Moreover, for well known characters like him. En los corridos de caro quintero los de antes solo se mencionaba la manzana que obvio es la marihuana. En lo personal creo que nunca movio coca ni chiva eso se comenzo en el 85 o 86 en cantidades grandes pero los fuertes eran colombianos en Mexico en ese tiempo de los 70s y inicios de los 80 era la mota en sinaloa durango chihuahua y sonora todos sembraban casi era normal y muchos la cruzaban asta 10 kilitos y se vendia facil en el norte asi era antes. La chiva o heroina ya se vendía desde los años 50s en mexico. En Monterrey había una familia de Treviños (no los del z40) que eran los reyes de la heroina en el noreste en los 50s y 60s. También en chihuahua había una señora que era muy querida por los tecatos de la vieja escuela. Incluso en los 70s muchos adictos veteranos de Vietnam tenían un programa especial en el DF donde les daban mantenimiento de heroina. well i moved there has kid me being de Durango i grew with the gallos and most have nothing all there is to move Pot so they turn to drug trafficking wich makes them have power and respect the gallos have a saying" I prefer 5 years has king than 50 like a donkey "
A combination of crisis, logistics, geography and help from US. Sinaloa was used by the US to grow opium for the morphine needed during World War 2. Japan had basically overran Southeast Asia were the morphine was produced. Sinaloa had a similar topography and ironically a small Chinese immigrant population that had already begun to cultivate opium in the hills in large quantities. The Sinaloan farmers jump onboard with helping the war effort and US govt rewarded them by buying their product. A practice that still exist today cause we all know that governments are the real criminals. What’s the true intentions for his interview? One must consider the possibility for sympathy and acknowledgment from those readers and law enforcement? Hidden and constantly running from authorities does not benefit him one bit. Rather adds more suspicion to his accusations? BB can you please ban E42 from posting in this site his comments have provide zero information, zero validity and at times zero logic. It’s like a child rambling and trying to sound intellectual at the same time. E42: Yeah, what's the point of interviewing when you know he can and will say precisely Zero about any of his activities, not least since he is obviously bound by a code of silence. I doubt he would break this just for the sake of an interview. @ 1156 Im right there with you man.... between E42 and El sol perdido... quite the combination of peanut gallery commentary; wanting to sound smart, and actually making sense, are two different things. I’m glad I’m not the only one who sees this. I can see I have offended some by their offensive posture from those supporters of such individuals. A frequent behavior commentating on posts with gibberish or cheerleading purposes. Rather with no real input nor solutions to what our countries are transpiring with. Suggest these few to bypass reading comments from unwanted thoughts / remarks. A hard task I’m sure for them to do so. I’m clearly stating the obvious here when an individual is pleading for pity and sympathy. Clearly there are legal proceedings to clear his name from prosecution. Moreover, from extradition if it were merited. So either one is trying to quiet one for his non compliance to a cause or simply a threat. Which I can care less. I do admit there are many here with great input to issues of matters and concerns. So do yourself a favor to refrain from dissatisfaction or unwanted behavior that many feel uncalled for. Suggest taking deep breaths and count to 10 before replying. Also thanks Chivis for your input. But would not want you to put yourself in any unwanted position of childish behavior. @chivis if these are the e42 post that actually get thought I would hate to see the garbage that gets denied. I agree tho were all equal and entitled to our opinion, this is simply mine. From the information I have read through the years , its not like he had been isolated , out of the loop doing his time . How many billion was claimed he made while in prison drug trafficking ? He has never been out of the game . I seriously doubt that's where he is spending his life up there running from hole to hole. Its a farce . Hell he may be living in the governors house . He is what he is . Paid for his crime ? I bet all murderers would like to decide that for themselves . I would like to decide what I pay for a can of beans . Let that start happening and were surely would have a bankrupt society . I don't believe he is toughing it in the mountains . Being as careful as the interviewer said they were going to him , I don't believe he was anywhere near where he stays . Probably laying on the beach someplace . Yeah you are right... this guy has billions of dollars and is a huge pawn for the mexican gov. To wave around. His time is coming. 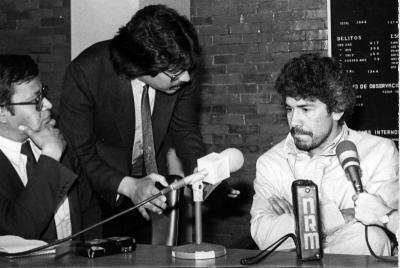 One buddy of Don Neto says he was exploited by guillemot Gonzalez Calderóni after the murder of Camarena, and that Don Neto would spends hour and hours listening to a tape, recorded when Kiki was being interrogated, AND I WANT THAT TAPE! 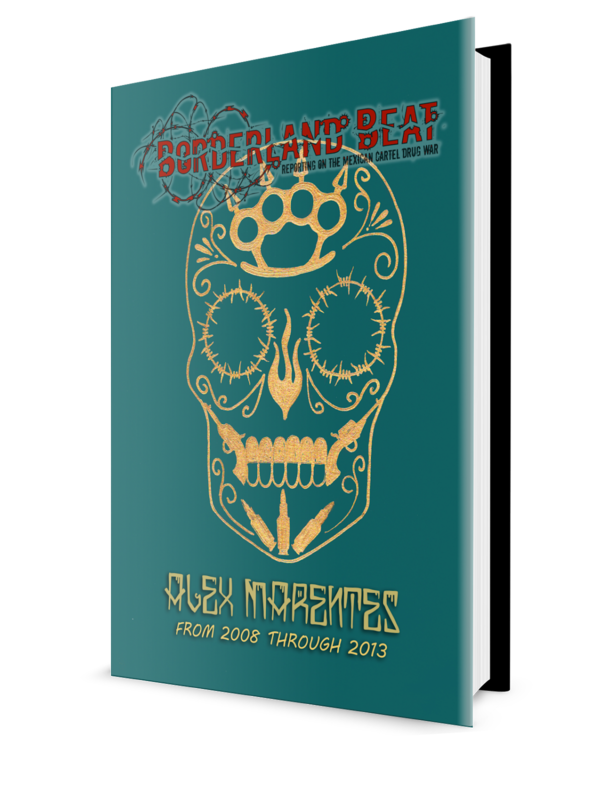 Someone said a copy was delivered to the DEA and there are others in possession of the Mexican government, with the voice of El Estupido Imbecil de la CIA, Felix Ismael Rodriguez Mendigutia, why don't somebody ask convicted accomplice Juan Ramon Matta Ballesteros? He is supposedly a prisoner on the US, he also cooperated with Felix Rodriguez in the corruption of El Salvador and Honduras among many many other putas chingaderas. Good article to read, the truth however whether or not he’s in charge nowadays won’t be known for some time though, it seems to me the DEA will never forget their agent getting killed and he will be a top priority until they kill or capture him whether or not he’s still a capo. Many say Caro was the most culpable for the abduction, torture and murder of Kiki. Just ask his partners in crime still doing time for the murder. Caro spent his time in Puente Grande running around the track and staying in peak physical shape while Don Neto deteriorated and seethed about Caro's plan to grab Kiki. Caro is a liar and a coward, protected by the drug culture and economy of the Sierra Madre. That pathetic excuse of a human needs to be caught and sent to the US where he can jog around his cage everyday. Steve, on the recordings of torture they found, RCQ was prominently displayed, if i remember correctly. Have you heard the tapes personally? Why are they not public? Back then a lb of weed could go for over a 1000 so this guy was ballin even if he sold at the border like he says thats how amado carrillo made it big too. All the traficantes bought at the border back then everyone could make big cash. Chapo ruined that by controlling even street prices in the USA back then it was diffrent realmente no existian carteles. Thats how it was i got my certificante on this stuff 6 yrs working and 4yrs locked up back in the 90s. Now he had to serve time in an American prison. Just. Like El Capito. Chivis. I never heard the tapes but knew some of the older agents who hunted down those on the Federation responsible. I know people, some innocent, who spent time with him in prison and had the opportunity to speak with Don Neto who said it was Caro’s idea. "Prosecutors also disclosed that Espino-Verdin's voice and that of Caro-Quintero have been identified on the interrogation tape. Carpet fibers and a bed sheet found with Camarena's body point to the Fonseca-Carrillo home as the site of his torture and murder, the prosecution said." I've heard , although the credibility is murky that Kiki himself was involved in the drug trade primarily in the Texas state, does any one know where Kiki was from ? By the way Kiki was a white washed Mexican from what the source tells he basically did the for dirty work for the law enforcement officers who were trafficking drugs. "Defense lawyers announced Monday that the Mexican government has formally protested the arrest of Verdugo-Urquidez, who has alleged that he was taken into custody by masked men on the streets of San Felipe in January, 1986, blindfolded and driven to the U.S. border at Calexico, where he was pushed through a hole in the fence into the arms of U.S. marshals. U.S. officials have admitted paying four former Mexican police officials $32,000 to apprehend Verdugo Urquidez." chivis . They were so paranoid from all the coke they were doing that they were kidnapping tourists out of restaurants thinking they were dea . I seem to remember one story where they had a couple , man and woman torturing them . The woman was naked and they were pulling a rope back and forth between her legs . She had rope burns so bad she was bleeding . That was before they murdered them. All the nut hanger can glamorize these dirtbags if they want . In my opinion there is no punishment to great for the . Having the opportunity , I would desecrate his remains . He has bodyguards. He has multiple cars and hideouts. Poor him. If he's not in the game then a big capo is protecting him. Some sort of a twisted homage. Only a matter of time before his "sponsor" begins to see RCQ as a liability. I don't see this ending well. A crazy weekend of binge drinking and snorting lines and it's "kill the old man". The interview was ballsy. I'll give him that. Any how camarena had no justification being in Mexico dea and all he had no business being there crazy fact he was killed over mj plantations that are now legal in USA/ camarena lo mataron por la coca y la cia no por la mota...piensen eso no tiene sentido.. Americanos matan mexicanos todos los dias en U.S.A y no los mandan para Mexico que piensas de eso Chivis why should caro answer for this really explain to me please? Si fuera al reves pero uno siempre es el Malo como en hollywood nunca hay un Mexicano bueno puro brainwashing de washington a su gente algun dia se terminara esto espero tambien nosotros andamos mal lo admito pero espero esto acabe pronto. 10:33 Your comments sound like you are probably of the same mind as a drug dealer . I dont undersand myself sometime. La vida de todos los grandes es dificil you know not everyone born poor lives to be a kingpin but what Choice or future did they have as for camarena he had no jurasdiction in Mexico so its a civilian case.. Just my 2 cents...cada quien paga x lo que hace tarde o temprano. Can you really be found guilty because they think that was your voice? I mean people sound like other people all the time. Berrellez claimed that he saw with his own eyes those accounts in electronic statements in 1995 while investigating the Mexican trafficker at the DEA headquarters. Berrellez retired in 1996. The U.S. government, he explained, was unable to seize the accounts because of the banking secrecy laws in those countries. He said the accounts were listed under the alien name that Caro Quintero, a major drug trafficker and fugitive from U.S. justice, used to do business with Mexican banks. “To my knowledge they were never confiscated,” Berrellez said. Caro should be detained and given the same treatment he gave the DEA agent. No trial. No prison. Simply eradicate evil from the face of the earth. Amazing how those who gave/give no sympathy when pleading for themselves. Give him the same amount of sympathy that he gave he DEA agent he drilled the hole in the head of.